Happy What I Ate Wednesday! I'm sharing some food highlights from the week as usual, but this week I also enjoyed a few great snacks that I want to tell you about. I have a fierce sweet tooth and I have always loved jelly beans. What I don't like is artificial colours. Not good for anybody, especially children. Luckily, there is a delicious alternative. The people at TruSweets sent me some of their yummy natural and organic Surf Sweets candy this week. These goodies are made with organic fruit juice and sweeteners, as well as natural colours and flavours. They are also free of nasty high-fructose corn syrup and GMOs and they're made in a nut-free facility. 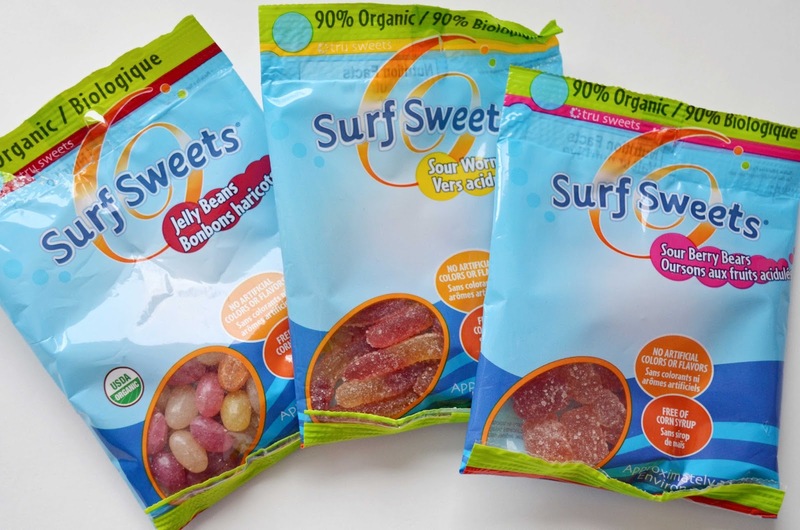 Surf Sweets are gluten-free, dairy-free and casein-free to boot. Each serving provides 100% of your daily Vitamin C too. The good news is I didn't eat all this candy by myself. The bad news is I didn't eat all this candy by myself. The family was keen to get in on this taste test. With all the benefits to these candies, you certainly don't lose any of those good candy flavours. We wolfed the candy down in seconds. All of it. Surf Sweet's Sour Berry Bears are delicious and vegan. Same goes for the Sour Worms. I think those are my new favourite. I bought Gummy Worms myself later in the week, but I liked the Sour Worms better. The jelly beans are vegetarian, but not vegan. Lest you think I only ate candy this week, here are a few other foods I enjoyed. I am focusing on breakfast because I tend to share my dinners on my Sunday meal planning posts. Rather than having toast with peanut butter every day, I'm trying for more variety. I had instant organic oatmeal one day and topped it with fruit, maple syrup and soy milk. Yesterday my son stayed home from school so I made us a special pancake breakfast. 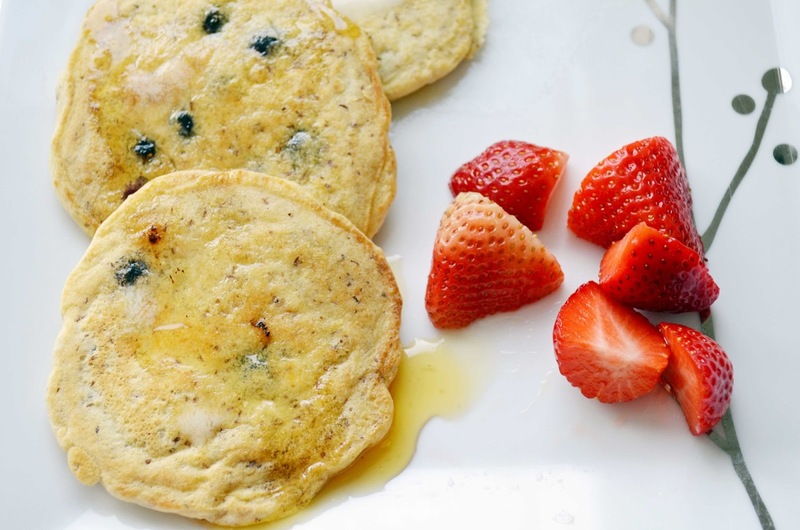 I used this recipe for Fluffy Vegan Pancakes with Blueberries. I was out of spelt flour, though, so I used gluten-free flour mix and 1/4 tsp of xanthan gum. They turned out very well. I might just do that the next time too. I have been continuing to share fruit platters with the kids after school. They can't seem to get enough pears lately. I'm all about the blood oranges though. Call me a pig this week, but I also enjoyed some malt vinegar and sea salt kettle chips. So good. One snack that I don't feel guilty about are these Health Warrior Chia Bars. I received some samples this week and they came in handy for afternoon snacks. I admit I'm late to the party when it comes to the wondrous chia seed. I have been hearing about chia seeds for a long time, but I didn't try any products containing them until recently. I enjoyed Health Warrior's Acai Berry Chia Bar. It has a nice, fruity flavour. My favourite flavour was the Chocolate Peanut Butter though. All of the bars have a nice chewy texture with a pleasant crunch from the chia seeds. The coconut was my least favourite flavour, but that's a personal thing. I'm particular about coconut. I only like it in certain forms. These little bars are packed with good things...antioxidants, 1000 mg of Omega-3, 4g of fibre and 3g of protein. At 100 to 110 calories per bar, they make a filling but low cal afternoon snack. They are 100% natural, vegan and free of gluten, dairy and soy. You can find Chia Bars at your local Whole Foods or visit Health Warrior's website. Enter to win a box of 15 Health Warrior Chia Bars in the flavour of your choice using the Rafflecopter widget below. You know what I would choose. This giveaway is open to US residents only. Sorry to my Canadian and international peeps! Never feel bad for eating candy as long as you enjoy it. Too bad you had to share, though ;) - but also kind of you. Those chia seed bars sound really good. When first trying chia seeds I wasn't too impressed but lately I've been rather fond of them. I recently tried raw food balls including them and they really gave that snack a little something-something. I've been debating trying chia seeds but I'm so picky (and it seems my taste buds hate all things healthy, ha) I haven't yet bought any since I don't know if I'll like them. Hm, chia bars sound like a good way to dive in given how much I love other bars. I always loved sour patch kids when I was little, so those sour worms are right up my alley! Not sure if I can get on board with the chia bars yet... they aren't my favorite. I bet you would like the sour worms then Ruthie. If you don't like the chia bars, there are lots of other good bars nowadays, aren't there? Oh cool, I'd love to try those chia bars - love those little seeds! Definitely some sweetness going on in here! :) I'm totally craving some candy right now, but thankfully there is none in range. Haha. Mmmm: those jelly beans would be good in some Easter baskets! My go-to healthy snack is a sliced apple dipped in peanut butter. O.M.G. Surf Sweets Gummy Worms are the best thing ever. Ever. They are my favorites. The sour ones too. I don't know how they make them so good, but I adore them. Yummilicious. I like hummus and veggies and I also enjoy fruit for a snack. 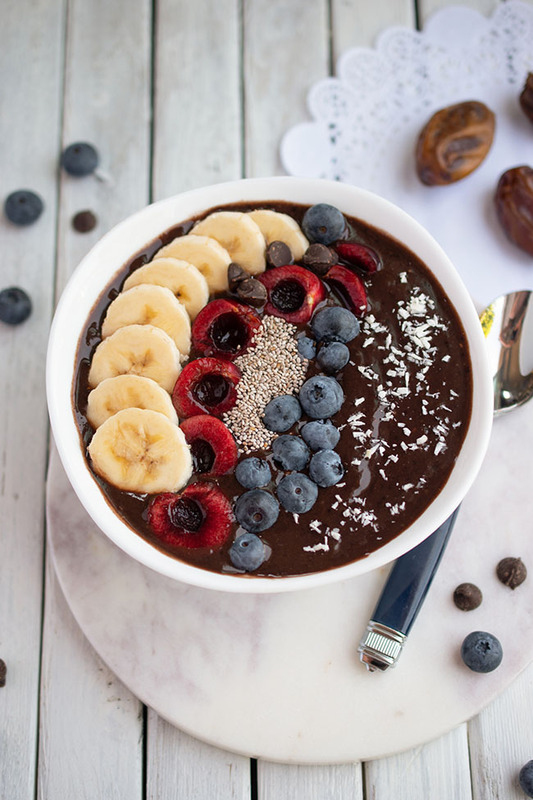 All of these foods look amazing! I would love to try them all.I just tried Surf Sweets for the first time yesterday and they are amazing. My go-to snack is almonds! I've been on a popcorn kick for snacking lately. My go-to healthy snack is hummus or fruit! I really need some good bars or packable snacks! My healthy go to snack are stuffed grape leaves. I always keep some in the refrigerator, and they're a good little nibble that's filling and light. My healthy go to snack is strawberries and frozen grapes...yum!!! Newest follower via the hop! I like that you featured a lot of healthy snack foods, this gives me ideas for things to stock up on. Also, I plan on trying those pancakes! Wow, this day looks so incredibly delicious! I really like those sour gummy candies and those chia bars sound awesome! 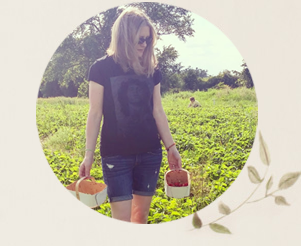 My go-to is almonds when I am on the go and yogurt and granola when I'm at home. I would love to try the Chia Bars! I like to eat baby carrots with hummus or almonds. raw fruits and veggies of all kinds. i like cucumber and carrots. My go-to snack is a banana. My current go-to healthy snack is a Lara Bar, but I am looking for something with chia so would love to try these! Bananas, nuts and seeds are our easiest to grab snacks around here. Right now my favorite snacks include carrots dipped in almond butter, greek yogurt with berries and dry roasted edamame! These chia bars sound awesome- i have chia pudding for breakfast often! I love apples with peanut butter! A perfect healthy combo! Yum! My healthy snack is usually fruit of some kind, frozen grapes or strawberries. And popcorn! Trail mix with nuts and dried fruit is my healthy snack of choice. Thanks! Hummus and pita chips are yummy! I like baby carrots and hummus! Dried fruit and a handful of nuts!